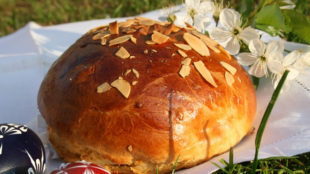 Mrkvance or even mrkvánky are traditional buns made from yeast dough stuffed with carrots. They come from the city Polná in the Highlands (Vysočina). One of the occasions on which were mrkvance baked, used to be a pilgrimage on the second Sunday in September. Pilgrimage was traditionally dedicated to the patron of the town St. Liguriáš and for the duration of the pilgrimage was front facade of houses decorated with bunches of carrots. Stew the carrot for about 15 minutes in butter with both sugar and pepper (and rum) and allow cooling. Into the flour with salt, sugar and lemon peel, crumble the yeast, pour lukewarm milk, egg yolks and finally melted butter and lard. Work smooth dough, sprinkle it with flour and let rise until almost double size. Create pancakes, fill the stuffing and close as well bun. Put them away from each other on a baking sheet covered with baking paper. Brush with melted butter and bake in a preheated oven at 180 ° C for about 25-30 minutes. After baking, sprinkle mrkvance with sugar.